niyati16 | Mentions | Blogger's World! Thanks @niyati16 for the prompt.. Had me thinking for a long time and hence a very late submission too! This photo, although a very simple interpretation of the word “smoke”, brings back a myriad of memories. Burning of the effigies of the demon king “Ravana” along with his brother and son, a quintessential part of Indian festival “Dusshera”. 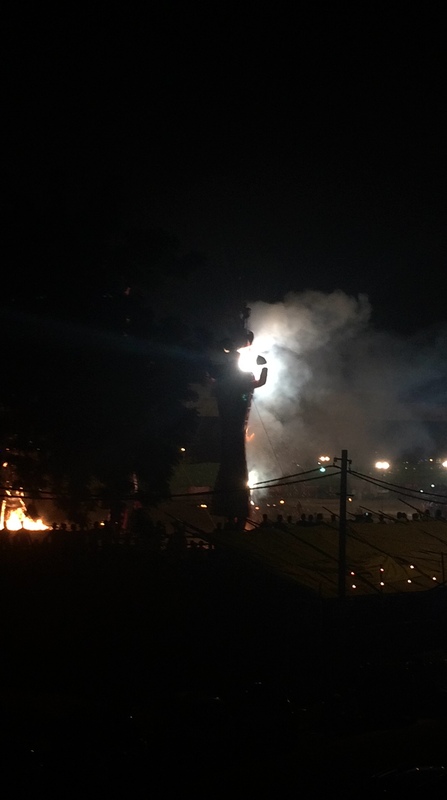 The burning symbolises the victory of good over evil. Hoping I have done justice to the prompt given out to me..
For the next week’s post – “an element of mystery” is the prompt for @adriennea3. The prompt for me was ‘Perspective’, shared by @arwen1968. Perspective was a difficult and a very interesting prompt. My take on it is this image. There is a difference between how we see the world, and how he sees it. Even if we try to know his perspective on life, we shall never be able to understand it completely. Our life might be a rough road with many ups and downs, but his life is a constant struggle. I hope I did a little justice to my prompt. This image has been clicked by Gaurav. (Can I please flaunt? 😛 my boyfriend) I asked him to share this image with me. You can all join in by posting on the prompt ‘Perspective’ on your own blog before next Thursday (15th Sept) and leaving a link to your post in the comments below. The prompt for you, @sadhanacs for 15th September is ‘Smoke’.